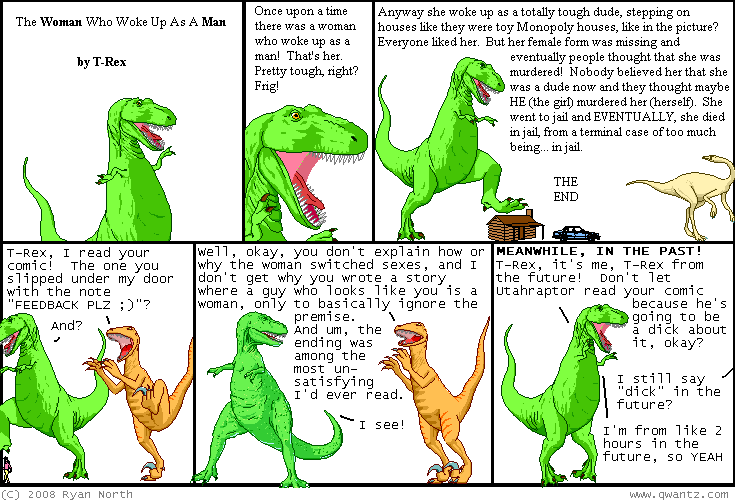 Dinosaur Comics - August 26th, 2008 - awesome fun times! August 26th, 2008: Guys I made a new shirt! Actually I've been working on this for a while and it's finally done. It is a very fancy, classy and colourful shirt that is awesome AND ridiculous. Check it out! EXTREME!! Combined with Mr. Tusks, below, I believe I can keep you and yours well-clothed from at least the waist up this fall season. You can visit the shoppe here! One year ago today: i like how dino babies goes straight to #1. #1 what? it doesn't matter! #1, baby!